Tuesday to Saturday, 10.30 to 23.00. Sunday and Monday, 10.30 to 15.00. 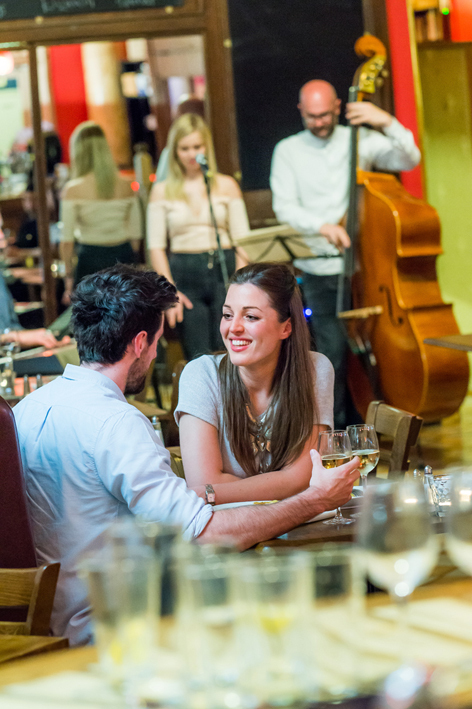 Green Park Brasserie is an independent restaurant, specialising in great, locally sourced food with free live jazz 4 evenings every week, from Wednesday to Saturday. The braz is centrally located in the beautiful, listed former Green Park Railway Station. There is room for 100 diners, a fully stocked bar for "just drinkers" and 2 outside but undercover terraces. We have 2 private dining rooms, upstairs, a small one for up to 10 people and a large one for up to 100. There is an Early Evening Diner and Fixed Price Lunch Menu as well as the a la carte, Sunday Roast Lunch and Saturday Farmer's Market Breakfast. There is free, easy parking in the evening. We were looking for somewhere with live music and a good atmosphere for our final evening in Bath and this place didn’t disappoint. The staff were attentive and the menu inviting - the food was delicious and portion size perfect for us - albeit a little on the pricey side - we had a great evening and would definitely recommend. 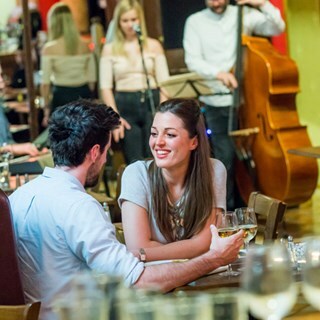 Great Restaurant with live music giving it plenty of atmosphere, and a cabaret feel to it. Popular with parties it is a bit noisy so avoid it if you want a quiet meal and a chat. The staff were great and the food was delicious - full of flavour. The live jazz music is a great addition too. Thank you! Excellent other than food could have been hotter. Thoroughly enjoyed it. My friend and I came for lunch yesterday and we were both disappointed. The menu was very limited, but more importantly the fish pies that we ordered were lukewarm. There's nothing more unappetising than food which isn't hot enough. The food was sent back to the kitchen, but re-appeared in the same condition. For a charge of £16 this is not acceptable ! Green Park Brasserie has a very bubbly, friendly atmosphere. There was a 11 of us dining for my Sisters Hen Do and they were extremely helpful and prompt, especially Luis. The food was delicious and timings of the courses were perfect. We had the three course set menu and plenty of cocktails and wine! There was also live music which was great and completed the dining experience. I would definitely recommend and I can't wait to visit again in the future. Overall fantastic - only complaint is that i had to ask three different member's of staff to bring me the drink that i had ordered which was quite annoying that i needed to nag over and over again just to get a drink with my meal. Every restaurant needs a Luis! Great service from Luis, relaxing ambience and good food and wine. Perfect for a special night out. Fabulous evening the venue is great with a great vibe. The service was top notch and the food was delicious, best shin of Beef I have ever eaten and the cauliflower cheese balls was mouth watering. The jazz was great playing all through the evening. We specifically chose this venue because of the January menu. We were visiting Bath for the evening. However, were disappointed to find that the menu was completely different to that the website suggested. We were handed the December menu despite being 4th January. Beside this, the menu was limited and consisted of Christmas pudding! This is something I questioned with the waitress, she consolidated management who said it was a marketing mistake! It was disappointing as we had chosen green park brasserie because we liked the sound of the menu. When our starters turned up, the roasted red pepper and goats cheese mouse, I received a pot of it with a small side salad and two crostini. On the menu, it said served with French bread something I later had to ask for. As I was finding it difficult to eat the mouse on its own! I was handed three small pieces of bread on a separate plate, not freshly baked after explaining crostini didn’t replace French bread. The mains were better but small portions. However, before clearing our starter plates away we were presented with our mains! The restaurant was bustling but not busy for a Thursday however, the view from our table wasn’t pleasant with a large number of empty dirty glasses building up on the bar. The atmosphere was good, the waitress friendly but we were generally very disappointed for a meal we were really looking forward to in a city we had never visited. Definitely preferable to a chain, much nicer surroundings! Service was cheerful and attentive but not overbearing. My family and I are big fans of Sunday roasts and often feel that eating out for them is never as good as home made. But the Brasserie really delivered!! Impressed a very hard to please crowd. Extra compliments for the fish pie too!! Also, not only were there 7 adults but also a 3 month old baby. When we arrived the table that was reserved for us didn’t have a lot of space for us to park the pram. But the staff helpfully relocated us to a bigger table with more space around it. Excellent service. One minor issue we had to wait nearly 45 minutes for our main course after our starter by which time we had finished our wine. Your maitre d was apologetic and we got a couple of complimentary drinks so not a big deal but maybe you need more kitchen staff on Saturday evening.? This weeks musicians were not as good as many others. They did not seem to enjoy their music. But we are regular customers and the food and service always most excellent. Staff could not have been more friendly and helpful. Food was delicious and the atmosphere great. Will definitely return. Thank you for a superb evening. fullfilled all the great reviews, amazing food and great atmosphere. I would never book here again. We booked for a Sunday roast for 6 people, to be told on arrival that you had run out of roast dinners! It would of been courteous of you to have called us to inform us of this, and maybe have given us a chance to book elsewhere!